In the past, I’ve written here about the Canon 6D and 6D mkii, the disappointing year with the Sony A7R II, and even the iPhone’s I’ve owned. Last year, realizing it was just plain foolish not having a back-up camera, I began researching a second camera. I had also ruled out getting another Canon 6D mkii for this purpose. Why rule out another? Well, while the Canon has been a great camera, this camera needed to cost less and not only fulfill the role of faithful back-up but also be something smaller to use when out with family. Summing this up, it needed to be smaller, take decent quality photos, and not break the bank. Looking at just about anything smaller in size, all name brands, the search narrowed after a few days. While considering other Canon cameras, there was also Fuji, Sony, Minolta, Lumix, and a host of others to review. Then, one camera began appearing more and more; the Sony A6000. Reviews like this one at PhotographyLife became helpful. It quickly became evident that this wasn’t some old camera that had been cast to the wayside, this was 2019 and people were still actively shooting with the 2014 Sony A6000! Really? Yup! Just search for photos taken with this camera on Flickr! After reading further, the enhancements to Sony’s later models, the A6300 and A6500 were primarily to address the A6000’s shortcomings in its video capabilities. However, even though the A6000 was released in 2014 and followed in 2016 by both the A6300 and A6500, all have the same 23.5 x 15.6 mm CMOS sensor. So, if you’re not concerned about the video enhancements to the later models that arrived in 2016, the A6000 is pretty much the same camera and a steal because it’s five years old! One serious benefit about researching the A6000 is that it’s been available for many years and so many people have reviewed it! Finally, when the A6000 arrived it came with the Sony 16-50mm f/3.5-5.6 OSS Alpha kit lens, it wasn’t a bad lens, I just didn’t care for it. At the 16mm end it didn’t seem to be the best wide angle and at 50mm it lack clarity. This photo at left, called The Staircase, was shot at ISO 800 on the El Paso Mission Trail at the San Elizario Presidio Chapel near El Paso, Texas. This is the only photo here shot with that lens. Why didn’t I like it? First, I read that because the lens is retractable, it pops out when powered up and retracts when powered down, that motor is the first thing to crap out. Second, there was some distortion in the corners especially at 50mm. Again, I consulted my good friend Google and was guided toward a Sony SEL35F18 35mm f/1.8 prime fixed lens. It costs about $50 more than the camera but was worth it. By relying on the 35mm and using the 16-50 sparingly for wide angle shots, I’ll hopefully extend the life span of that retractable lens. It’s not a bad lens, just not my cup of tea. Frankly, I found that I like SEL35F18’s 35mm focal point more than I like 50mm in my Canon lenses! This may be why I use the 40mm f/2.8 pancake lens more than the “nifty fifty.” Recently, the Canon 6D mkii went back to the states for cleaning, forcing me to rely on the A6000 for a month. Being completely honest, I didn’t shoot for a couple of days because I just didn’t feel like going out with the back-up camera. However, once I did, it was quickly evident how great the A6000 was, this was a powerful camera in a little package. The photo at right, The Kids, was taken of two Japanese girls wearing kimonos in Kamakura, Japan. The first thing that blew my mind and caught me off guard was the burst rate. The Canon 6D mkii fires a burst rate of 6.5 FPS, or Frames Per Second, meaning in one second it captures 6.5 photos. However, this little A6000 from 2014 shoots at 11 FPS, almost 5 shots PER SECOND more than my Canon!! What? I couldn’t believe how fast this thing was at capturing movement! Let’s put this in to perspective, Sony’s newest flagship camera, the Sony A7R III, only shoots at 10 FPS! I hadn’t really known much of the Sony A6000 back in 2014 when I was having an extra marital affair with my original Canon 6D. However, this A6000 must have been a monstrous beast back then shooting photos at 24.3 MP and face detection included, sporting a tilting 3 inch LCD screen with 179 phase-detect focus points and the already discussed 11 fps continuous shooting! It’s also a capable landscape camera as well, I recently took the below photo, Rock Art, at Tomyodo Beach near Yokosuka, Japan and I think it’s a decent example of the A6000’s capabilities. 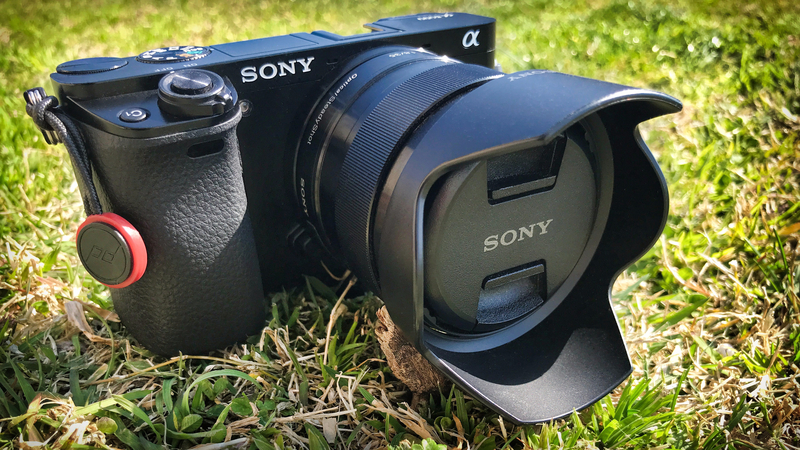 Don’t take my word for it, this thing is such a beast that the travel website, Independent Travel Cats, recently published an article entitled, Travel Photography: Best Mirrorless Cameras for Travel 2019 and this Sony came in at number two! Yes, the five year old camera with technology from 2014, was still relevant at number two on that list! Sony is currently on the Sony A7RIII, while I don’t know of anyone using the original Sony A7R, that original A6000 is still actively used out there. While I wish the battery lasted longer, minimizing the LCD view time has helped battery life. I’ve also never been a fan of Sony’s menu system, it seems to have been designed by drunk guys at a bar… However, the bottom line here is that if you don’t give a flying you know what about shooting video, you may want to look in to the Sony A6000. It’s been a very pleasant surprise to shoot and I plan to devote more time to it! I’m much more likely to grab this camera on days I just don’t want to lug a bag around. Happy to say the A6000 is no longer just a back-up camera, it’s now the other camera.